Detail: Perfect Sunrise A marvellous sunrise of orange lilies and seasonal flowers. This round bouquet is full of happiness and energy with the power to brighten up any day! 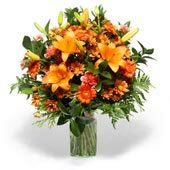 Round bouquet made with orange lilies, and seasonal flowers like gerberas and chrysanthemums and varietal greenery.